The concept of digital inventory and supply chain management in healthcare tends to conjure up a scenario wherein hospital inventories take care of themselves. Smart bins that report stock levels without counts, set their own par levels, calculate what is needed at every location and then automatically create requisitions and forward them to your MMIS. Making those items from every supply chain manager’s wish list a cost-effective reality is the mission of PAR Excellence Systems. Since its inception in 1993, the Cincinnati-based company has been offering integrated hardware and software technologies that automate inventory management and free caregivers from manual inventory tasks. 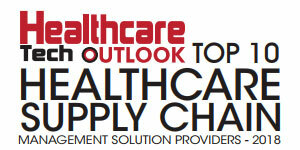 Healthcare inventories have always faced countervailing forces. On the one hand, unrelenting cost pressures argue for keeping supply levels as low as possible. But busy caregivers want products to be available close to the point of care in ample supply–without the need to spend time recording their use of every item. Couple that with the pressure exerted by costly, fast-evolving inventories in specialty areas such as the OR, cardiac catheterization, and interventional radiology, and the result can be SKU proliferation, overstocking, and distractions from patient care. Leveraging game-changing insights from materials managers and logistics specialists, PAR Excellence aims to strike a balance, with tightly controlled inventories close to the point of care. PAR Excellence’s weight-based model—PAR Bins—uses a network of highly sensitive scales that continuously report inventory levels and usage to a software backend that performs sophisticated analytics to keep stock levels and spending optimized. 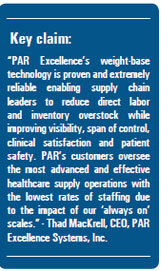 In 2018 PAR Excellence launched a specialty suture scale, which is calibrated for extremely lightweight suture packets and features an integrated product container that is mounted to the scale and designed to facilitate first in, first out (FIFO) inventory management. Offered in metro-rack, wall-mounted, and mobile configurations, each suture SKU is on its own scale. The solution addresses a chronic supply chain challenge for all hospitals while reducing inventory and improving both infection control and patient safety. 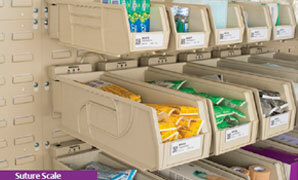 PAR Excellence’s array of automatic, modular, weight-based suture management solutions— Suture Cube, Suture Wall, Metro Rack, Mobile Suture Cart—work cohesively to address diverse needs from reducing product expiration risks and costs, improving patient safety with fewer stock-outs to eliminating the labor required for requisition preparation. 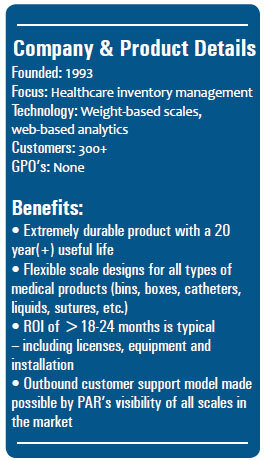 Best of all, PAR Excellence suture management solution delivers a rapid ROI, paying for itself in less than 12 months. PAR Excellence’s solutions can be implemented quickly and work within each hospital and clinic’s existing storage infrastructure with little modification. Interfaces to hospital systems such as MMIS (item files, requisitions, POs) and patient charge enable automated order generation and patient billing. PAR Excellence’s customers also report strong results in keeping mission-critical supplies at the ready while keeping spending under control. “Since moving to PAR Ex, our bin fill rate has been above 98 percent,” says Alyssa Odenkirchen, Manager, Supply Chain Analytics for Rush University Medical Center in Chicago. 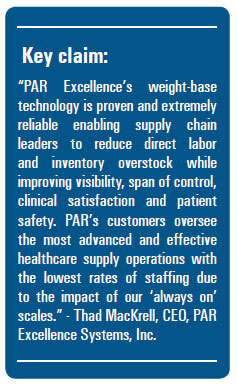 “PAR Ex has helped us optimize our inventory on hand by identifying usage patterns across various service lines. With real-time reporting, we are more agile in working backorders, converting products, and identifying items during a recall.” Behind it all is 24x7 monitoring and support to keep each customer’s PAR Ex infrastructure running and proactively solve issues.